The Samsung Galaxy Tab 4 NOOK comes with a built-in (and non-removable) rechargeable battery. The battery probably still has some power in it from testing at the factory, but please resist trying to use it immediately. You want to be assured that the battery, the charger, and the tablet itself are each working properly. It may help the battery’s longevity. That is, if you properly condition it with a full charge before using it first. After the battery is fully charged for the first time, let it drain down to nearly empty, then recharge it fully; do this for the first three or four cycles. When you first turn on the tablet, you have to register the device with all of its various parts makers. You have to sign in to a Wi-Fi system with an active Internet connection and sign in with Samsung, Google, a few apps makers, and Barnes & Noble; be sure to install any software updates. Attach the larger end of the USB cable to the charger. Pay attention to the black positioning bar inside the charger and its corresponding bar inside the cable. Don’t force the two positioning bars against each other; the cable only fits one way. Attach the USB cable to the Samsung Galaxy Tab 4 NOOK. The smaller connector on the cable connects to the port on the bottom of the tablet. 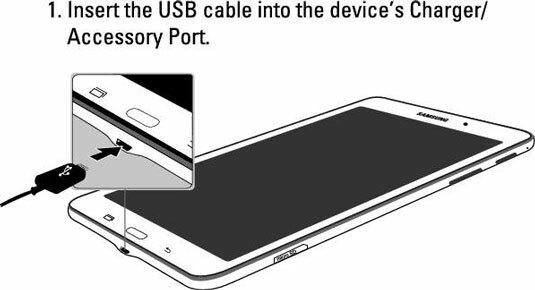 The side of the cable end that has the three-forked USB symbol will be facing you as you’re looking at the front of the tablet. Again, don’t force the plug in the wrong way. Go for a walk, mow the lawn, read a book, bake a cake. For the first three or four times you use your tablet, drain the battery to near-empty and then fully recharging it. 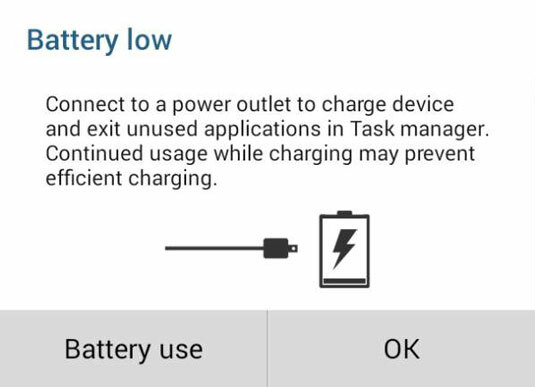 When you plug the charger into a powered-off tablet, the screen will briefly show a battery-like object. You can see roughly how full (or empty) the device is. The drawing disappears after about 15 seconds, and after that there’s no way to know the device is being charged: no indicator lights. You’ll just have to school yourself to recharge the battery for six or eight hours if it nears empty. You can recharge your Tab 4 NOOK by connecting the USB cable to a USB port on a PC, although this is a very slow process that takes as many as 10 hours for a full refill. Consider the USB charging option as an emergency backup only.